Is My Guinea Pig’s Cage Too Small? A mistake that a lot of piggie owners make, especially those new to owning guinea pigs, is having a cage that is too small for them. It is easy to get a cage from a pet store or get it second hand and think it is sufficient for a guinea pig will be happy enough in the cage. However, the truth is that the cage needs to be big enough for them to run around in and exercise. The minimum size for keeping one guinea pig is 7.5 square metres. This is really important as they get bored very easily and their quality of life will deteriorate. Often in pet stores, you will see cages or hutches that are just far too small for them (like the one above) and being in a small cage makes for a miserable life for a piggie. So as to work out whether your guinea pig has enough or will have enough space in their cage or hutch, here are some things to consider. 1. 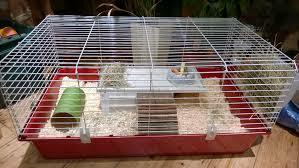 Firstly, when getting a cage always think about whether they will have sufficient space to run around in. Do you have sufficient space in your home to make this available? 2. Standard guinea pig cages are almost always too small for your piggies. Why not be creative and try and expand the area around them so they can exercise in, especially if you have more than two piggies. You could also use a good wooden box. The piggies don’t care. If your cages are outside this can be done by combining two cages around a pen which can be used to give the guinea pigs space to run around. If its inside then, make a space and create a tray like space for them to run around on. 3. Why not build your own with a C&C cage. These are the best on the market for good sized guinea pig cages. These are different form cages you might find in a pet store and are such that you can construct with the guinea pig’s happiness and well being in mind. Check out their site for more details and some great ideas for alternative cages. If you have two guinea pigs the minimum size should be 7.5 square metres. If you have three guinea pigs the minimum size should be 10 square metres. If you have four or more guinea pigs the minimum size should be 13 square metres. These are generally thought to be the measurements that most piggie owners use to ensure that their piggie cages are the appropriate size for their guinea pigs. So if you are pondering the question ‘is my guinea pig cage too small?’ then use those guidelines and you’ll get the answer. I’m sure cage size is square feet, not metres. Though runs are much larger.